Upstairs you will find a fully equipped, eat-in kitchen complete with Dishwasher, Microwave, Toaster, Coffee maker and all the pots, pans, dishes and utensils you will need. The Master bedroom is located on its own level and has a king sized bed, a 32′ flat screen TV, and a really nice private bathroom. On the main floor there is a queen sized bedroom, and 2 bedrooms each with 2 twin beds. The living room has a 42′ flat panel TV with DVD player. 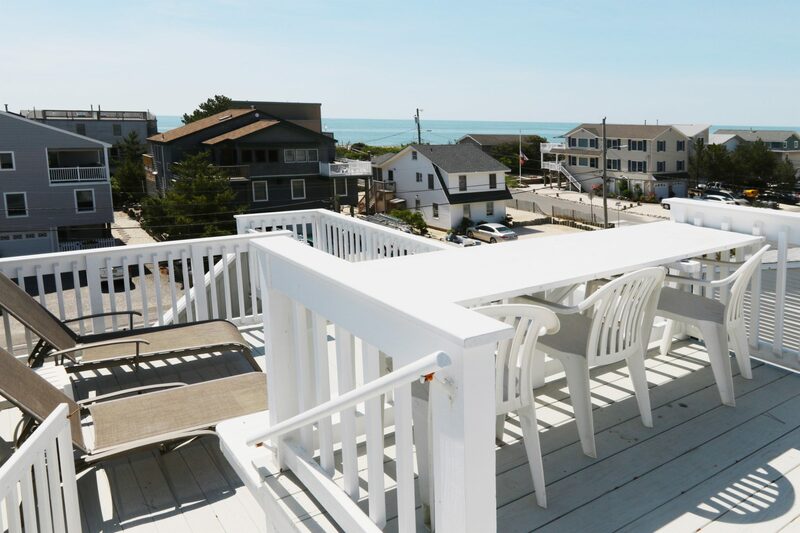 There is a dining deck off the living room of the main floor and the Upstairs unit has exclusive access to the rooftop deck which walks up from the dining deck and offers great ocean views. The Upstairs features central air throughout. There are 3 bedrooms and 1 bathroom Downstairs. The lower unit features one bedroom with a queen sized bed, and 2 bedrooms each with 2 twin beds. The living room has a 42′ flat panel TV with DVD player. Downstairs also enjoys its own fully equipped, eat-in kitchen and a dining deck off the living room. There is ductless air conditioning in the living room and all of the bedrooms to cool the entire floor. Bamboo hardwood floors are throughout the home. Other amenities include wireless internet, High Definition cable TV, dishwashers, washers and dryers, microwaves, clothes iron, pots and pans, toaster, coffee makers, blender, glasses, and dishes. Outside there are two outdoor showers and a fenced in yard with dining area, BBQ and storage shed. ** Rates may be subject to NJ Sales & Occupancy Taxes. *Rates may be subject to NJ Sales & Occupancy Taxes. Note: We only accept reservations 350 days in advance to allow this season’s guests the opportunity to reserve the same week next season. If you would like to be placed on our waiting list, or have a special event that requires advanced planning (like a wedding), simply enter an inquiry and note in the comments your desired dates.